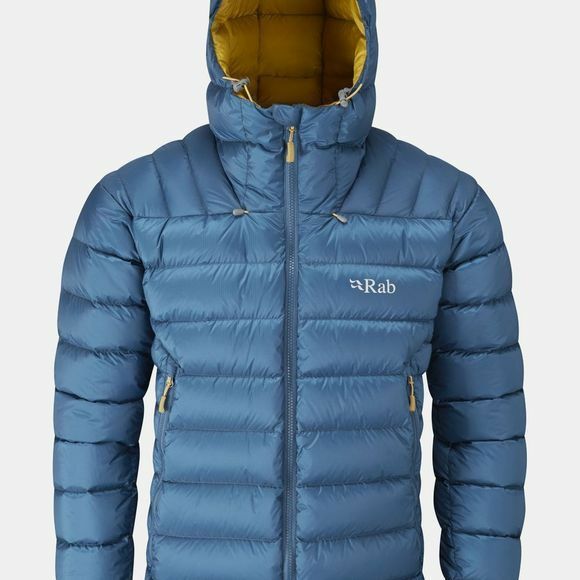 The Men's Electron Jacket from Rab is a mid-weight, technical down jacket, with a water-resistant Pertex outer shell, designed for year-round climbing and mountain use. There is a stitch-through construction throughout, with varying size baffles that reduce bulk in key areas and help eliminate cold spots. Exceptional levels of warmth are provided thanks to European Goose Down that features a small-volume helmet-compatible hood. Technical features include elasticated stretch woven cuffs, YKK vislon zips throughout and a zipped internal security pocket. Designed for cold weather climbing and mountain use, the Electron jacket is suitable for day-to-day winter use with high levels of comfort and packability.